We’d love your help. 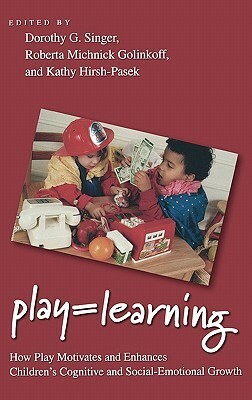 Let us know what’s wrong with this preview of Play = Learning by Dorothy G. Singer. Why is it that the best and brightest of our children are arriving at college too burned out to profit from the smorgasbord of intellectual delights that they are offered? Why is it that some preschools and kindergartens have a majority of children struggling to master cognitive tasks that are inappropriate for their age? Why is playtime often considered to be time unprodu Why is it that the best and brightest of our children are arriving at college too burned out to profit from the smorgasbord of intellectual delights that they are offered? Why is it that some preschools and kindergartens have a majority of children struggling to master cognitive tasks that are inappropriate for their age? Why is playtime often considered to be time unproductively spent? In Play=Learning, top experts in child development and learning contend that the answers to these questions stem from a single source: in the rush to create a generation of Einsteins, our culture has forgotten about the importance of play for children's development. Presenting a powerful argument about the pervasive and long-term effects of play, Singer, Golinkoff, and Hirsh-Pasek urge researchers and practitioners to reconsider the ways play facilitates development across domains. Over forty years of developmental research indicates that play has enormous benefits to offer children, not the least of which is physical activity in this era of obesity and hypertension. Play provides children with the opportunity to maximize their attention spans, learn to get along with peers, cultivate their creativity, work through their emotions, and gain the academic skills that are the foundation for later learning. Using a variety of methods and studying a wide range of populations, the contributors to this volume demonstrate the powerful effects of play in the intellectual, social, and emotional spheres. Play=Learning will be an important resource for students and researchers in developmental psychology. Its research-based policy recommendations will be valuable to teachers, counselors, and school psychologists in their quest to reintroduce play and joyful learning into our school rooms and living rooms. To ask other readers questions about Play = Learning, please sign up. A very useful collection of empirical research articles on the thesis that play=learning. Informed by developmental psychology and social-constructivist approaches to learning it is both scholarly and accessible. A must read for new and practising teachers faced with the pressure to ditch play in the name of standards and accountability. As government in the US and UK go further down the formal teaching route this book reminds us that humans are naturally and spontaneously playful and that failu A very useful collection of empirical research articles on the thesis that play=learning. Informed by developmental psychology and social-constructivist approaches to learning it is both scholarly and accessible. A must read for new and practising teachers faced with the pressure to ditch play in the name of standards and accountability. As government in the US and UK go further down the formal teaching route this book reminds us that humans are naturally and spontaneously playful and that failure to provide opportunity for play in formal education is detrimental for individuals and society. A clarion call that must he heeded. The book is also of interest to all parents and those working with parents in a range of circumstances including poor socio-economic contexts and those who are learning disabled to show how play can support their needs. Parents interested in the role of play in their children's lives and how they can support them will also find this book accessible.